Two emerging concepts based out of Los Angeles, California will soon open a joint location in San Diego's Pacific Beach. Taking over the nearly waterfront space that last housed the short-lived Aloha Poke is DRNK coffee + tea and QWENCH juice bar, a rapidly expanding coffee shop and juice bar chain. 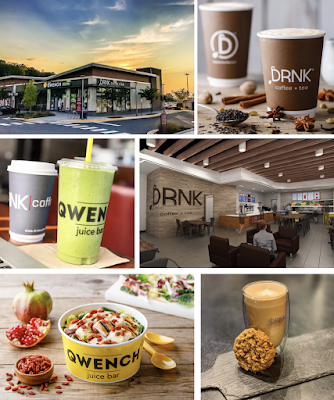 Born in Hollywood in 2013, DRNK coffee + tea and QWENCH juice bar are sister concepts housed under one roof that have grown into a global franchise, with nearly a dozen locations around Los Angeles, as well as incoming sites in Virginia, Texas, Florida, New York, Saudi Arabia and Dubai. DRNK offers a menu of organic coffees, espressos and teas rounded out by fresh-made food items like sandwiches, wraps, salads and paninis. DRNK also houses a tap system positioned front and center dispensing organic cold brew and nitro brew. The QWENCH juice bar side of the concept is centered around a diverse selection of raw squeezed juices, nutritionally enhanced smoothie blends infused with superfoods, and signature handmade organic Açaí bowls, as well as breakfast and lunch bowls and burritos. The first San Diego locations of DRNK and QWENCH will install at 740 Hornblend Street less than a block from the ocean in Pacific Beach as early as this summer. Based on the success of the intitial branch, more outposts may open around America's Finest City in the coming years. For more information, visit DRNKcoffee.com and qwenchjuice.com.